Just when you thought that the dismally failed application of "shock and awe" to subdue enemies of the United States would have discredited further claims for technological silver bullets that would make war less terrible, at least as far as U.S. forces and civilians bystanders go, the specter of the new age of robotic armies is rearing its head. O brave new world, that has such soldiers in't! This supposed march of progress is promoted in two recent newspaper articles. The first, featuring the work of Georgia Tech computer scientist Ronald C. Arkin, ran in the New York Times a few weeks back and explored the possibility that robot soldiers - not being susceptible to the emotional stress of combat or the rage that accompanies the loss of comrades, for example - could provide an armed force that would always operate within the bounds of predetermined ethical constraints. Not quite Isaac Asimov's pacifistic Three Laws of Robotics, which require that not only robots not harm humans but also that they not allow humans to come to any harm, the putative Ten Commandments for these silicon soldiers would be some firmware version of the Fourth Geneva Convention - at least for starters. The second robot-army manifesto was an op-ed piece by John Pike in the Washington Post. Pike's thesis, less surprising than the proposition that robots might outperform us ethically in the heat of battle, is the old-fashioned notion that, given the choice of sacrificing blood or treasure, we should opt for treasure. 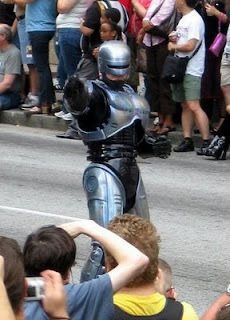 According to Pike, the kind of technology that would make robot fighters a reality is "soon - years, not decades" off and would result in the creation of highly efficient "stone-cold killers" replacing their human counterparts with the effect that "the writing of condolence letters would become a lost art." Pike goes on to argue that the U.S. adoption of such technological means would herald the dawning of a new age in which "the large-scale organized killing that has characterized six millennia of human history could be ended by the fiat of the American Peace." Much of the opposition to the idea of robot soldiers will come from either those more or less opposed to technology categorically or from astute technologists, people who understand how limited our capabilities actually are as far as designing computer systems that can react appropriately to complex and unanticipated real-world situations. For now I'll leave it to others to pick these technological bones. My concerns here are more down-to-earth. Even if we presuppose that robotic soldiers can be designed to distinguish friend from foe and genuine threat from harmless bystander across an enormous spectrum of combat scenarios - a tall order to say the least - they will nonetheless require rules of engagement that are determined by human decision makers. Accuracy in target identification, level of acceptable of non-combatant collateral casualties, priority of self-preservation, these all become parameters that must be set for each robot for each and every military mission. The promise and failure of precision-guided munitions - i.e. smart bombs - is illustrative in this regard. I would guess that many more Iraqi and Afghani civilians have been killed and injured as collateral damage resulting from "precision" U.S. air strikes in the wars in those two countries, strikes that have stayed, for the most part, well within specified rules of engagement, than have died as a result of the actions of American soldiers who have "lost it" and run amok. In other words, the ability to delegate ethical agency to robot soldiers - highly refined precision-guided weapons in a sense - may not insure "ethical" outcomes. On the contrary, such delegation may lead to dangerous behavior on the part of the U.S. military and its leaders by encouraging reckless adventures and by creating the appearance of a lack of personal responsibility for missions that go awry. Whose Pax Is It Anyway? As far as John Pike's vision of the golden age to be ushered in by robot armies enforcing some sort of Pax Americana goes, it appears so naive that I had at first thought it might be a hoax or a satire, along the lines of Johnathan Swift's, A Modest Proposal. Apparently it is not. What surprises me most about Pike's position is not that he believes that robots might be an ultimate weapon, but that he believes any such ultimate weapon might exist at all. It's not for nothing that the phrase "arms race" has entered our lexicon as the designation for an open-ended sequence of actions - and corresponding reactions - each a futile attempt on the part of one or the other of two competing parties to gain a final advantage over its adversary. In the realm of biology, the unthinking forces of natural selection are responsible for this kind of undirected contest. Within the world of human affairs, the blame must be placed with those who believe - in spite of all historical precedent - that their nation alone has access to some specialized knowledge that their opponents will never, ever possess. Whether based on gunpowder or steel or TNT or atomic bombs or MIRVs (multiple independently targeted re-entry vehicles), these technology monopolies don't last forever. Indeed, in the modern world they are often short-lived. Little more than 4 years separated the first American and Soviet fission bomb detonations. Apparently the ace that Pike believes that the U.S. military has up it's sleeve is Moore's Law, which describes how the capability of semiconductor-based technology increases at an exponential rate, with the doubling of processing speeds and a corresponding reduction in costs every two years or less, for example. Well, I've got news for you, Mr. Pike, the U.S. doesn't have a lock on Moore's Law and the prospect of powerful and sophisticated army of Chinese robot soldiers "soon - years, not decades" is a very real one. Perhaps America will decide to engage in yet another round of the arms race as a tactical necessity, but don't be fooled for a minute into believing that it will lead to some enduring break in age-old human military conflict. Better keep examples of those condolence letters for the loved ones of fallen soldiers handy. As Robert E. Lee remarked, war is terrible. This is a fact that is unlikely to be mitigated much by creating a ethically-constrained robotic army. It is also a fact that is likely not to be evaded by misguided attempts to end the arms race once and for all by playing some sort of robot-soldier technology trump card. The U.S., in spite of its misadventures in Iraq, has the opportunity to turn its attention again to diplomacy and the support of international law, the only realistic approaches for establishing a meaningful and enduring peace in the world. Spending billions of dollars on robot soldiers will only undermine our efforts in this regard.